I believe no one would ever attempt to say that letting go is easy. Regardless of age, gender and status in life, letting go and moving on will never be an effortless and painless task. Letting go entails sacrifice and I'm sure each one of us have our own agonizing to inspirational stories to relate. The courageous kid I admired moved on to experience the loving arms of our creator. Her mother, Sheye Meyer, made this site as a tribute to the short but very meaningful life she had. Thank you Ava. I believe God wanted me to see your video to relay an important message. May your life continue to inspire and remind us that everyone is capable of conquering his own battle in life. Friday! My favorite day of the week. Friday makes me feel that I survived another full week of working. Friday also reminds me that the next two days means rest. I can wake up late, have time to finish my books, share special meals with my family or go out with my friends. And by the way what is the best word that rhymes with FRIDAY, it's PAYDAY! So as a simple treat to myself, I went out with my friend, Anne. We strolled the Ayala Malls, ended up purchasing the same white blouse and had dinner at Pancake House. A stroll around the mall, a nice chat with a friend and food are simple priceless things that make me happy. Sorry for the blurred and grainy pics. I was using my defunct camera phone here. 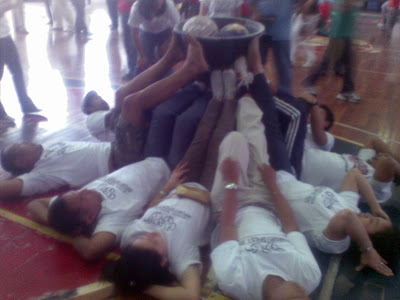 The game involves 10 members, who are tasked to balance a flat basin that holds two balls and flour, using only their feet. 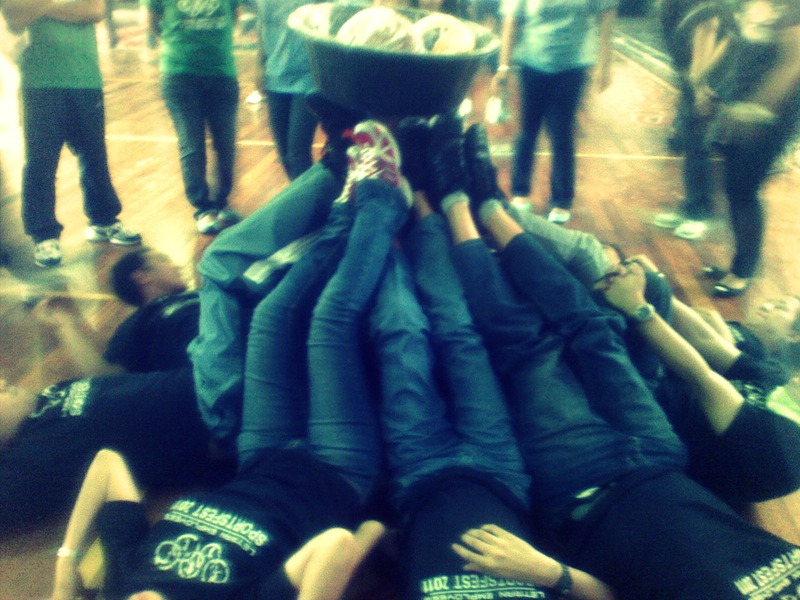 The team who can balance the basin the longest time wins. Once the basin falls, everyone will most likely be bathed with flour. ;-) This game is ideal for family reunions and even team building activities too. PS Thanks to my friends who left uplifting comments in my last post. We all grew up with toys and I believe we have our unique toy stories. We have toys that relate our unadulterated childhood memories. I came from a family who does not have that much in life. But my parents never deprived me the chance to play and experience having toys. With the support of my Aunties and godparents, I was able to enjoy that once in a lifetime stage of my life. Who have not loved Barbie? Barbie Dolls were like the best friend of every little girl. Owning a Barbie unfortunately does not bring the contentment. Who could ever forget those spare dresses, accessories and the Barbie house. I never had a Barbie house but my imagination made me convert cardboard boxes as my own version of Barbie's house. I never owned a Cabbage Patch Kids doll. I was contented in seeing my affluent playmates who were privileged to own this sweet-smelling doll. 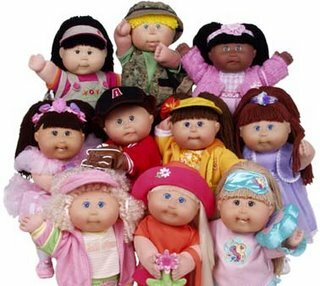 Cabbage Patch Kids dolls are rarely available and quite expensive to purchase in the Philippines. I had this simple wish that before I turn 30, I will be able to own at least one of this sweet and chubby doll. I love Word Boggle than Scrabble. I get irked with Scrabble when I am left with consonants. How could you form a three letter word with x, q, and z? 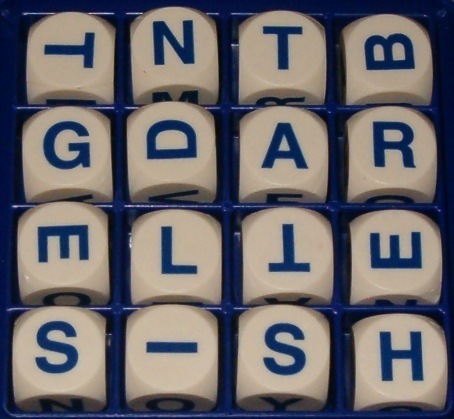 Word Boggle instead requires an extensive vocabulary and the ability to see, twist and play with the patterns. Although today, I rarely see a Word Boggle playset in department stores. The rise of different computer generated word games have killed the sales of the Word Boggle, Scrabble and other board games. I love to play board games only if I have plenty of companions. It's boring and less exciting with limited competitors. Unlike other toys, no creativity and technique are needed here. Board games are about luck and chances. The game is simple but the unpredictability of outcomes brings the excitement. (Just like life?) 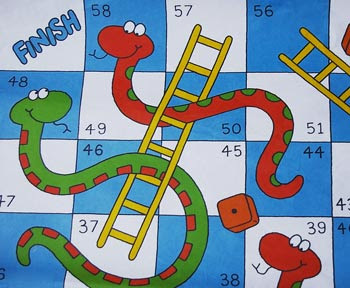 I encountered a lot of board games but the snakes and ladders became my all time favorite. Who did not dream of having her own play house? 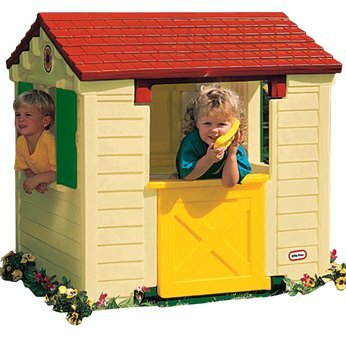 I never owned a playhouse but I enjoyed the playhouses provided by kiddie oriented fast food chains. I remember my favorite playhouse and mini-slide at the Cubao branch of Wendy's Hamburgers. The playhouse I enjoyed at Wendy's looks exactly with that of the picture. If money will no longer become a scarce resource for me, I might end up fulfilling this childhood dream too. hahaha! ﻿﻿I love food, I was interested in cooking but I never gained the skill to do it. 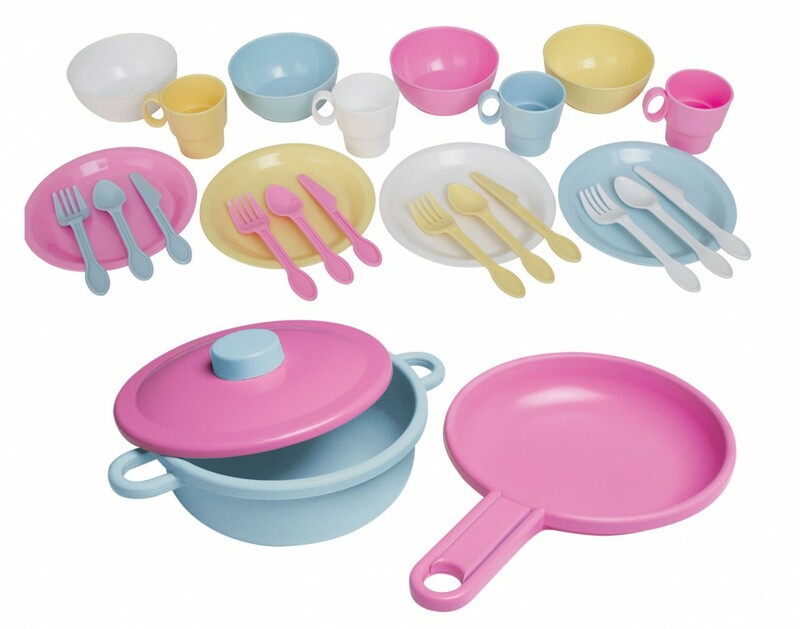 But when I was kid, I always wanted to play the role of the cook with these toys. I even end up arguing with my playmates because everyone wants to be the cook. Everyone wanted to be the slave cook than the sitting pretty customer. Jackstones! This game requires patience, skill and practice Unfortunately, the numerous practice did not earn me the skill to perfect this game. My mind, hands and attention can't just get perfectly coordinated. This explains why I also didn't excel in dancing, sports and other physical activities. I grew up in the years when electronic games are starting to proliferate. Instead of counting my age, I'd like to believe that I had the privilege of observing how technology innovated toys. Here are the classic electronic toys that partly deteriorated my eyesight and made me forgot playing in the streets. 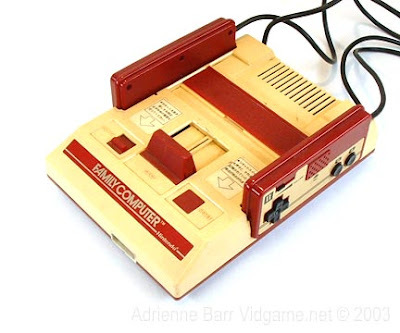 Before PSP and Wii came, there was the Nintendo Family Computer and Gameboy. How could I ever forget the Super Mario Brothers, Battle City, Donkey Kong Jr., Star Force, Bomber Man and Mappy. Can't relate? Sorry if I am too old for you. Oh well, there's google. I believe this electronic gadget only grew in the Philippine market. 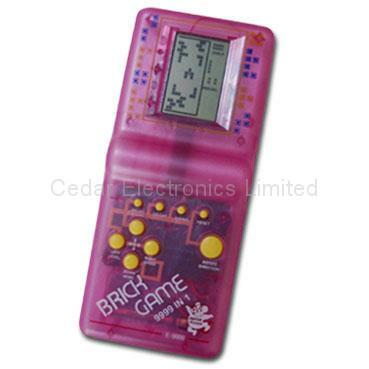 ﻿The brick game adopted the concept of Tetris. It's like a Gameboy but the games are already embeded in its system. No need to buy and insert those Gameboy chips. I got my brickgame when I was 10 years old, courtesy of my Tita. Left, right, rotate, and down! I admit these technologically empowered toys spoiled my childhood. 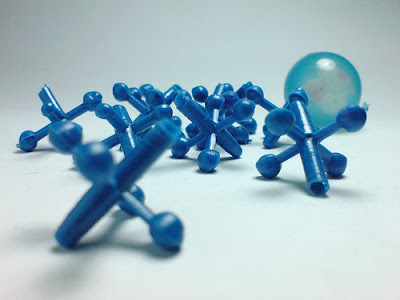 At some point, these toys deteriorated my eyesight and made me ignore my outdoor playmates. My source of happiness were suddenly confined in a TV set and a small box of artificial games. Kids today will definitely have a different toy story to relate. I can already see a different version from my nieces and nephews. I rarely see them play with dolls, cars and those outdoor games. Most of the time, it's the desktop games and their PSPs that keep them occupied. Some researches even attribute technologically empowered toys as a leading source of increasing obesity among kids. It boils down from the fact that computer games lessen the physical activities of kids. I have been invited to become a godparent to a number of kids. As of today, I have seven god children. A godparent is entrusted with the responsibility of becoming a second parent to a child. Supporting the parents in rearing the child is supposedly the real task of a godparent. Sadly, not all parents and godparents are able to imbibe this thought. Some people see baptism as an event to "show-off. "The gifts, food and celebration sometimes overcome the real purpose of baptism. My Ninang (Filipino term for the female godparent) Isiang is one of the few people who understands and lives the real definition of baptism. More than the Christmas and birthday gifts, my Ninang Isiang served as my second mother and bestfriend. She was always present in the most trying moments of my life. She believed in my capability and she knows how to uplift the sad and weak person in me. Few weeks ago, my Ninang Isiang surprised me with an invitation. She wanted me to become a godparent of her first child. I was left with the question, why me? I even thought her email was a mistake. But after a series of emails, I finally believed that the invitation was for me. The baptism rites was held at Sto. Nino de Praga Parish in Antipolo and a simple reception followed at their residence. I was reunited with some friends / sisters at the reception. The beautiful women are my sisters in our church. We were once active members of the Legion of Mary, a Catholic organization devoted to the Blessed Mother Mary. These women have witnessed me transform from a skinny high school student to an overweight employee. Hahaha! This is another reason why I love attending simple gatherings like this. I become reunited with people I haven't seen for ages. It might take months before I could see Hannah Sofiel and my Ninang Isiang. Even though distance separate us, I know we are bonded with a special relationship. Thank you for everything Ninang Isiang and to Hannah Sofiel, I pray that you grow up healthy, happy and thankful for having the best parents in the world. 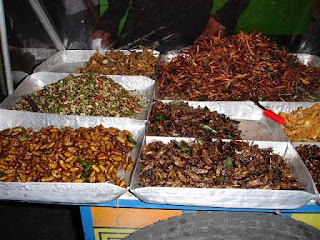 If you don't have the stomach for street foods then skip this post. I was on leave from work last Friday. If you have been following my blog, I have already mentioned that I need to consume my vacation leave credits. In the Philippines or at least in my workplace, an employee earns 1.5 days of leave per month, once he reaches his permanent status. The traditional practice was companies pay the vacation leave credits in case the employee fails to consume it. The employee's leave credits are converted to cash based on his daily rate. But today, local companies have become wiser. Instead of paying the leave credits, employees are forced and scheduled to take off from work. I consumed one of my 25 days of leave credits last Friday. I spent my entire morning reading books. In the afternoon, I went out with my colleague and bestest friend, Tinee. Our destination: the University of the Philippines. We met at the university not for any academic related task but for the ultimate food trip. I like to reiterate my warning, if you are not into street foods then don't anymore proceed. The twisted orange in a stick is called "Isaw." Isaw is made from grilled chicken or pig intestines. The intestines are cleaned and boiled repeatedly, until it becomes finally edible. My mother never allowed me to eat any kind of street foods. Isaw was never a part of my childhood days. But when I finally hit the streets during college, I was able to have a taste of the famous Isaw and other street foods. It's Saturday and I am spending my quiet afternoon at home with my family. This weekend was way relaxed as compared to my last week's mall escapades. I already planned to spend my weekend at home because I am expecting a blast from a Friday night reunion with my former colleagues. It was supposedly a reunion of six people, who once comprised the Research and Publications team of a school. Five of my six colleagues promised to join. Unfortunately, only the three of us came. This wasn't our picture last night. This was taken in 2007, back when I was 110 lbs and my career was just starting. (Sigh) We had fun though two of our colleagues broke their promise. We made a lot of catching up stories and recalled our adventures and misadventures in the workplace. We failed to take pictures last night because we were so full of stories, food and drinks. This entry in my planner would perhaps forever remind me of how we squeezed in our last three years in one night. I love reunions and I used to love organizing reunions. A recent experience however taught me to forget about organizing this type of gathering. But with Ate Mitch and Tinee, I know no effort is ever wasted. You two are the best. Reading Madeleine Wickham's (Sophie Kinsella) Wedding Girl. This is the first hardbound novel I have purchased.I love books and novels but I always prefer the cheap paperbacks. A recent sale from my favorite National Bookstore in Cubao gave me the chance to finally own a real hard bound novel. I love French Fries and it used to be a regular weekend afternoon snack at home. I believe this is healthier than the frozen french fries in supermarkets. My niece wanted to sleep over at home so this evening it will be the two of us in my room. I have to thank the Zapp family for recognizing the good heart of the Filipinos. We may not be the most industrialized country in the world, but our unique love and compassion will always differentiate us. The Zapp family became known for traveling the world using their 83-year old vehicle. The Zapp family is comprised of the Argentinian couple, Herman and Candelaria and their children, Pampa, Pewe, Paloma and Wallaby. 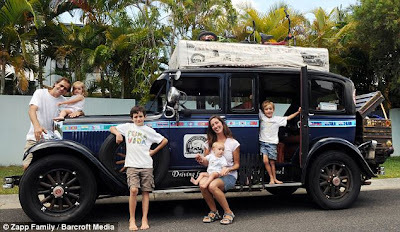 The entire family have crossed continents for the last 11 years and their only home is this 1928 vehicle. Believe it or not, the Argentinian couple and their four kids live in this vintage car. The car was so versatile because it serves as a bed and living room at the same time. Their car is being shipped as they move across countries. During their visits, they are adopted by kind families in their own homes. The Philippines is one of the countries they have recently visited. My gratitude to the Zapp family overflows because this article from the Daily Mail UK reported the couple's experience with a Filipino family. Herman and Candelaria related that a Filipino family gave up their lone bed and piece of meat for them. The kindness of the Filipino family did not end on that selfless act. They even apologized to Herman and Candelaria for not being able to provide that much during their stay. The international media rarely recognize the hospitality and good heart of my countrymen. Most of the time, it's the negative news that brings the name of my country to the world. Some people don't even know that the Philippines exists. One of my greatest wishes as a Filipino is for the world to recognize the good heart and kindness of the Filipinos. We may not be a wealthy country but anyone could always find a home in the Philippines. My first stop was the Riverbanks Center in Marikina City, my hometown. The Riverbanks Center is the first mall established along the stretch of the Marikina River. A greater portion of the mall is occupied by the famous Save More grocery. Save More is like a household name for grocery in the Philippines. Every city in my country has a branch of this grocery. The Riverbanks Center also houses bazaars offering cheap shoes, clothes and bags, and factory outlets of international brands such as Mossimo, Guess, Nike, World Balance. In my country, most of the international brands are very pricey. The taxes and transport costs inflate the prices of these international products. Just to give you an idea, this Cath Kidston bag priced at $45 sells for Php 4,000 or $100 here. But don't get dismayed about my country. We have locally produced commodities that you will love too. This shop in particular sells cheap but beautiful cloth bags. The prices of the bags sold in this shop will not exceed $10. Anne and I agreed to meet near this shop but since I arrived earlier, I was able to bought this bag. This bag costs only Php 160 or around $4. Since the shop is also a wholesaler, you can get volume discounts. When I saw this bag, I was reminded of Cath Kidston and my friend, Duni. Duni makes sleep wears and bags with floral designs and sells them through her Etsy shop. All of her works are handmade so you are assured of high quality. I wanted to buy more bags (Shopaholic attack!). Good thing that my friend Anne arrived and I was prevented to shop more. Anne and I then went to our next stop, SM Marikina. 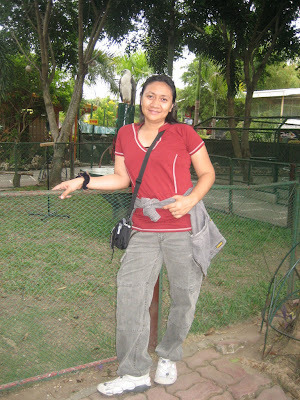 If you have been following my blog, then you might have read of SM Marikina. SM Marikina is a four storey mall that houses around 70 to 100 stores selling clothes, shoes, bags and other merchandise. It has a few restaurants and movie theaters. The mall is relatively smaller as compared to the other branches of SM department stores. But for some reasons, I love this mall because it is not congested, every place is so clean and organized and it provides an overlooking scenery of the city. My friend Cheryl mentioned in one of my posts that she is interested in seeing what's inside SM Marikina. So here it is my friend! I was not able to take a decent shot of the facade because of the sudden rain. You will better appreciate the glass architecture of the facade once you are inside the mall. This is perhaps what made me love SM Marikina. Unlike other shopping malls, SM Marikina's architecture used glass to capitalize on the use of natural light. The mall did not follow the traditional design of a fully enclosed building. The architecture also provides a relaxing view of the city. The towering buildings in the next city, the newest line of the mass rail transit, and some pieces of greeneries. During night time, this is how the glass and metal architecture looks. The seats you can see is intended for a mini-concert which normally happens during weekends. Bungee jumping for kids and for those who remain kids at heart! Anne and I watched the fifth installment of The Fast and Furious. I am a big fan of this series and I have waited two years for it. And my verdict of the movie, it's a must see and as always, there is a teaser for the sixth installment. Piece of advice: finish the movie until after the end credits. Someone from the past gets resurrected. After the movie ride, Anne and I went real shopping! ;-) I got myself a floral black and white button down blouse and a brown belt from Bayo. I am currenlty addicted on button down blouses with this style. How do you call this cut or style? Anne and I was too engrossed malling. We haven't noticed that it was raining the entire Saturday afternoon. So after our shopping, we decided to transfer to another mall for dinner. We had dinner at our favorite Red Ribbon branch of Robisons Metroeast. When the mall announced its closing time, the rain has stopped and we parted ways to finally go home. Anne and I always leave the mall on closing hours. That's how shopaholic and strong our feet and legs are. We never get exhausted only inside the mall. hahaha! Thank you Anne for the fun filled day. Still tired from Saturday, I got up early for Mother's Day. I have promised my mother that we will go out on that special day. 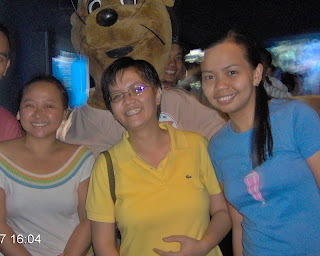 We went to Gateway Mall and SM Cubao. I forgot to bring my camera so I don't have pictures to share. But next time, I promise to blog about these two places soon. I would not have become the person I am today without the mothers in my life. Yes I meant motherS! Ninang Isiang is my second mother and best friend. She was always there on those instances when I felt so weak and alone.Though distance separated us, she would exert all means to reach me. Thank you for everything Ninang Isiang. You were one of the few persons who always believed that I could make things happen, despite my failures and weaknesses. Thank you for the never ending patience of listening to my pains, sadness and frustrations. 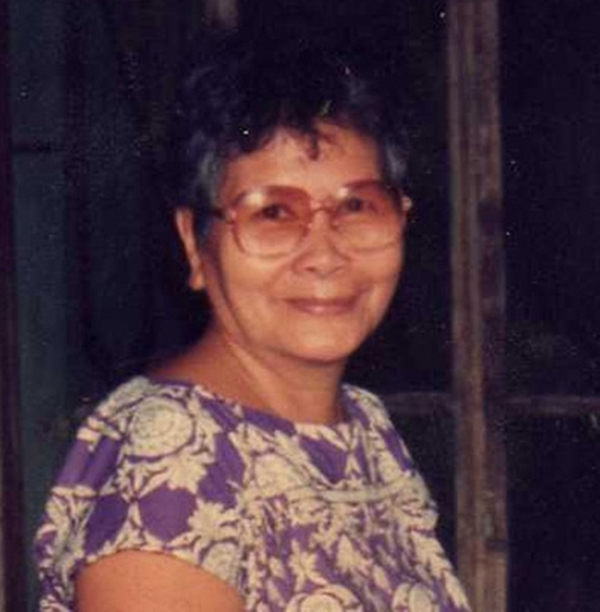 She is my paternal Lola (grandma)! My family used to live in the compound of my Lola for more than 10 years. She was my second mother at home. She wasn't the grandma who would spoil her grandchildren with toys, chocolates and junk foods. Lola scolds me like my own mom. Though Lola was not the kind of grandmother I see in TV shows, I know she loves me. She have shown that love that only me and my cousins would understand. Lola already joined our creator two years ago. You will always be in my heart Lola. I am so proud to be one of your grandchildren. Our relationship was not perfect. We have a lot of differences and argue most of the time. But despite my mistakes and misgivings, you were always there for me. You continuously took care of me and supported all my endeavors. I love you and I am looking forward for more years with you. To all my followers and fellow bloggers who are mothers, thank you for accepting the gift of motherhood. You are the most courageous, honorable and loving persons in this world. Happy Mothers Day! Before I start this post, I would like to thank my friends in the blogosphere who wished me well. For some reasons, I just felt so down and lonely over the past days. Through your prayers and God's help, I'm feeling better now. Today was a fun filled day for me. God perhaps wanted to make me forget all my worries and problems in life. My day started with my friend's wedding. I attended Jen and Marlon's wedding with my two High School friends, Anna and May Ann. My previous post showed some pictures of that event. I spent the afternoon with my cousin, Annette and my niece, Alexia. We went in this beautiful restaurant in our hometown. The shot of the facade was already perfect, if not only because of the improperly parked Chevrolet. Here is a closer look of the shabby and rustic facade of the restaurant. An antique wooden windmill greets every guest of the restaurant. The windmill is surrounded by a pond and different ornamental plants. I just love the idea of the windmill! Where else can you find this in the city? Most of the neighborhood bakeries cook Pandesal using an electric or LPG (liquefied petroleum gas) powered oven. 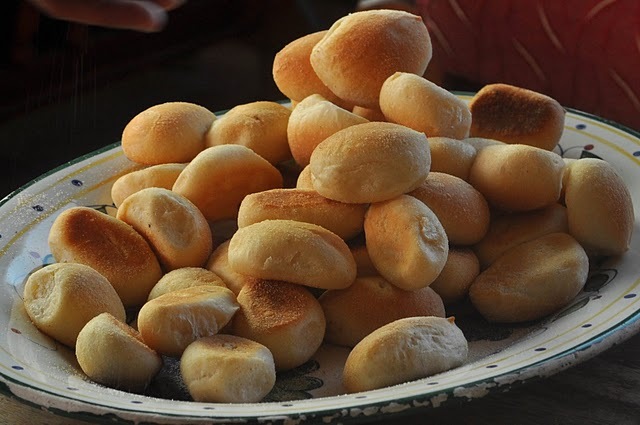 Pan de Amerikana however bakes its Pandesal with the use of the traditional "Pugon." The Pugon is also called as the wood-fired oven. Instead of coal or electricity, all bread produced by Pan de Amerikana are baked using the traditional wood and fire. The facade window will give you a view of the traditional Pugon way of baking bread. The right side of the window has a well, not really a "functioning well" but a "fountain well." That's me and my niece, Alexia. The entrance of the restaurant with the kid fooling around Mr. Baker. So what's inside the shabby and rustic restaurant? There are picture frames that boasts the celebrities and other prominent personalities who have visited the restaurant. The colored tiled window serves as a cover to the restaurant's cooking area. If I am not mistaken, the tiled window came from an Antique house. Have you noticed the ceiling? They are filled with tree branches and a vintage glass chandelier. Whoever thought of using the tree branches is very resourceful and creative. There's a Hanging Bridge that leads to a resting place under a tree. If I were the owner of this restaurant, I might as well invest in building a tree house. Not all kids in the city are able to experience playing in tree houses.This might make another attraction to the restaurant. Well, even us grown ups.. hahahaha! I hope you all had a great weekend. Tomorrow is Monday, rest is over and back to work. With a well spent weekend, I am praying and looking forward for a better week.